Quality Control | Suzukuni & Tokiwa Industries Co., Ltd.
We make rigorous analysis and sound judgment. In the modern market, high-quality is a matter of course and even higher quality is required. 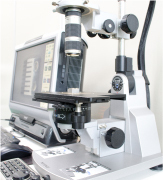 Suzukuni & Tokiwa Industries pays keen attention throughout a year to careful maintenance of our machines and calibration of our measuring instruments for highly precise measurement. With these efforts, we promise our customers the highest quality. Production lines play a vital role for our customers. As a production machinery manufacturer, STS regards the strict quality control as the most important task. “Zero Quality Complaint”, we always do our best to assure the highest quality to satisfy our customers. Our company strictly keeps delivery dates at the same time assuring the highest quality by effectively introducing state-of-the-art machine tools and highly accurate precision measuring instruments. Coordination among our production sites through information network also adds to achieve efficiency. Suzukuni & Tokiwa Industries (STS) complies with laws, regulations, and other policies regarding product safety. The company widely communicates the product safety rules including laws, regulations and the internal rules to all the employees by conducting trainings and education to ensure their strict enforcement. STS makes sure that it provides products that are safe and reliable. The company complies not only with the safety standards set by laws and the industry but also with the voluntary safety standard to continue to improve the product safety. In the event that an accident occurs on our product, we make every effort to establish a system to collect relevant information. We take appropriate measures such as collecting the products in question and fixing them, if deemed necessary, in case an accident occurs. Based on this Basic Policy on Product Safety, STS formulates and implements its voluntary action plan on product safety. We will establish and foster the “Customer first” and “Safety assured” corporate culture by constantly refining our action plan to ensure its effectiveness.